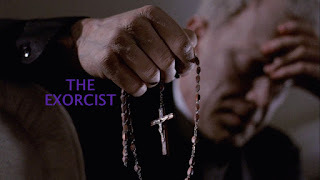 This week’s pick for Hit me with your best shot was "The Exorcist". 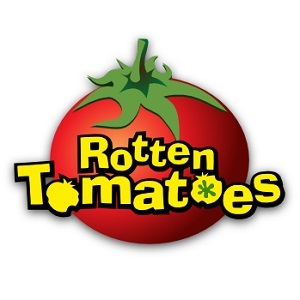 This movie is seriously disturbing and I kinda hate Nathaniel for making me watch it again (not really). The film definitely has lots of shocking images to choose from for a best shot. Apart from the iconic scenes with the possessed Regan, there are some subliminal flashes of the demon throughout that are truly terrifying. What I found most interesting in this viewing was how the characters adamantly refused to believe that she was actually possessed. In a recent interview, director William Friedkin said that he wanted the film to focus on this mystery of faith (rather than the horror aspects). As I watched the film I thought this concept really came across perfectly. 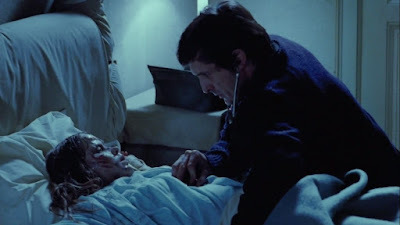 In the early part of the film, Regan goes through some really intense tests in an attempt to figure out her illness (they often reminded me of those brain-washing scenes in "A Clockwork Orange"). They just couldn't put their faith in this notion of a demonic presence. In real life, I think people would freak out if there were such blatantly obvious signs of a supernatural presence (furniture moving on its own, spinning heads etc). In most horror movies the monster initially appears to only a few people, resulting in an understandable "false alarm" situation. This demon however, is one bad mofo and wants the whole world to know it. My favourite shot therefore touches on this innate desire for rationality in the face of extraordinary circumstances. My favourite shot is from a late scene when the final exorcism is being conducted. This is pretty late in the game and prior to this exorcism, Father Damian is still not entirely convinced that a demon is living inside Regan. Just before this shot, Damian has witnessed a levitation and an apparition of his dead mother among other creepy things. The religion-based remedy seems to be working, but his conscience forces him to include some sort of normal clinical treatment. So...he pulls out a stethoscope. What’s he supposed to learn from that?! What makes it even more interesting is that Regan's atheist mother has long accepted the possession, but this "man of faith" is unable to believe. That entire final scene is quite good. Were I not so adamant on the element which intrigued me most, I'd have used something from the scene. But, a best shot without Ellen Burstyn sort of doesn't make sense to me. For some reason, the only scene that still freaks me out is the spinal tap sequence. That scene makes me so queasy! It looks so invasive and bloody. Every time I scream "get away from her, don't touch her". That scene is so thrilling even if you know what's coming. this is my favorite of your entries thus far. Love the commentary on that shot. The confusion that Regan/Captain Howdy instills in both priests whether their rational mind or their fear mingled with compassion is truly compelling. one of my favorite repetitive beats is that both priests touch her face to mop up sweat or turn her head to let that green slime gush out. Thanks for the comments guys. Much appreciated. @Jose and Nathaniel - it really is weird how tender and compassionate they are with her. I mean, she's pretty gruesome with her potty-mouth, bloody lady parts and green slime.